The Amora chapel veil with blusher layer offers the perfect hint of elegance and formality. This veil is one of the most popular styles in our collection as it suits a wide range of wedding dresses and venues, from formal ceremonies to relaxed garden affairs. This veil is characterised by a classic raw edge which creates a sleek, chic effect with a nod to the traditional. The Amora veil can be worn with sheath-style dresses to fuller elaborate gowns for maximum impact. Subtle gathering at the comb for volume. Customisable: Shorter or longer lengths available, including blusher length. The Amora wedding veil is made to order. Please allow 2-3 weeks for production plus delivery times. Rush orders available for a fee. As this veil is made to order, please leave your height and heel height measurement at checkout. Please also let us know where you intend to position the veil’s comb (at the crown, above a low set bun etc), as this will impact the length of the blusher and the veil. If you have any questions, please feel free to contact us to discuss! Designed for unstructured and structured wedding gowns, we love to pair the Amora veil with long sleeves, high necks, low backs, floaty feminine silhouettes, illusion necklines, cap sleeves. 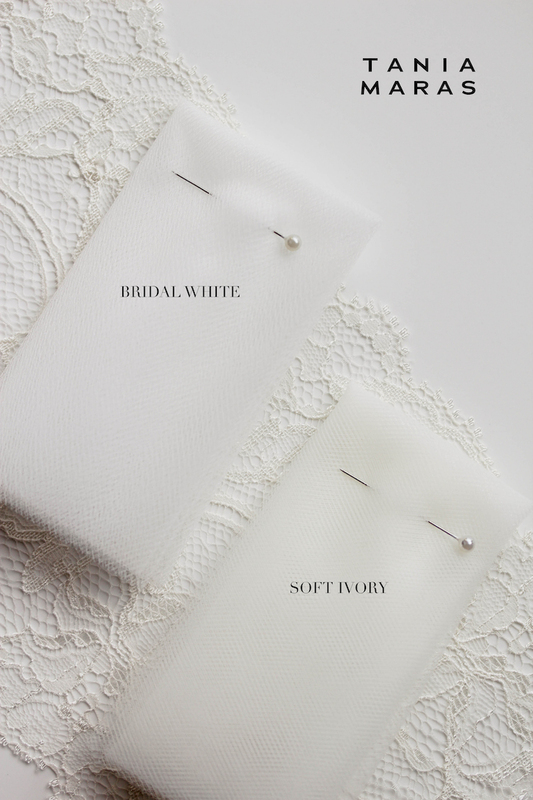 This veil is one of our most versatile when it comes to styling. It is truly an exquisite piece that suits most wedding gowns and silhouettes. This veil is designed to sit at the crown of the head or above a bridal updo. If you have a preference for how you wish to style your hair, do let us know when you order so we can ensure the comb is placed accordingly. Our Amora veil falls to 230cm from the comb to the end of the train. It can be customised to any length to suit you and the length of your train. If you are unsure which length will best suit your wedding dress, please contact us with photos of your wedding dress and height and we can get back to you with a recommendation. The Amora is handcrafted from a lightweight bridal illusion tulle. It’s available in bridal white or soft ivory tones. We like to aim for a colour match or a shade lighter than your wedding dress.